Bad breath, or halitosis, is breath that has an unpleasant odor. It can be caused by a multitude of factors. Bad breath can be periodic or chronic. While it may be embarrassing, it is often easily curable! Here at Adams and Cheek Dentistry we want you to be proud of your mouth and smile! Read on to learn about factors that may cause bad breath and how you can free yourself from halitosis! Poor dental hygiene- Improper or lack of brushing and flossing can leave food particles to decay inside the mouth. Infections in the mouth- Gingivitis and Periodontal Disease. Respiratory tract infections- Throat infections, sinus infections, and lung infections. External agents- Strong smelling foods such as garlic, onions, and coffee, cigarette smoke, and chewing tobacco. Systemic illnesses- Diabetes, liver disease, kidney disease, lung disease, sinus disease, reflux disease and others. Some people notice their own bad breath while others get told they have it by a friend or family member. You should always discuss it with your dentist or dental hygienist at Adams and Cheek Dentistry. We will perform an examination, ask you a series of questions, and as a team determine the cause of your bad breath. Oral home care is essential in preventing bad breath. 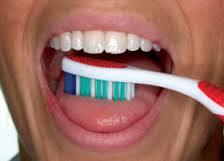 You should be brushing your teeth at least twice a day for a full two minutes, brushing your tongue, and flossing. Rinsing with mouthwashes approved by the American Dental Association and chewing sugar free gum also aid in controlling bad breath and aiding in plaque removal. Click here to take Colgate’s Fresh Breath Assesment. To schedule an appointment with Adams and Cheek Dentistry in Raleigh, North Carolina click here or call our office at (919)866-1360. PreviousPrevious post:Dental Implants in Raleigh, NCNextNext post:Raleigh Family Dentist Answers: What are Cavities?